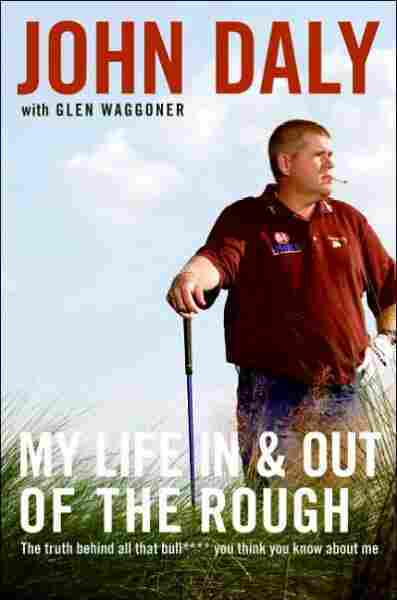 My Life In and Out of the Rough NPR coverage of My Life In and Out of the Rough: The Truth Behind All the Bull****You Think You Know About Me by John Daly and Glen Waggoner. News, author interviews, critics' picks and more. November 15, 2007  Bad-boy golfer John Daly doesn't have an exercise regimen. He begins his day with a Diet Coke and a cigarette, and he has battled addictions to alcohol and gambling. But he sure can play. His new book is Golf My Own Damn Way. Back in the summer of 1991, my first year on the PGA Tour, I wasn't exactly what you'd call a household name in golf, unless you happened to spend a lot of time in my mother's household. Finally, after three and a half years of scraping by on the minitours and the South Africa Tour following my decision to drop out of college and turn pro in 1987, and after four trips to the PGA Tour's brutal Qualifying School, I'd earned my Tour card for the 1991 season. By the beginning of August, I still hadn't won anything, but I'd made about $160,000 up to that time, so I was feeling okay. I wasn't tearing it up or anything, but I'd made a bunch of cuts, and I'd finished fourth at the Honda back in March and third in the Chattanooga Classic in July. All year, word had been spreading a little about this redneck kid from Arkansas who could really let it fly but sometimes had to do some looking for it after it landed. So at tournaments I'd draw some fans around the tee to watch me hit driver. I never saw too many people along the fairways watching me hit my second shot, but that was okay. I knew I had some other clubs in my bag. Anyway, I'd wind up that year leading the PGA Tour in driving distance with just under 289 yards (288.9, if you're a stats freak). That would be good for about number 98 in 2005, and probably out of the top 100 in 2006. But back then, it was like 6 yards ahead of Greg Norman, who was number 2, and people were taking some notice. Playin' the Tour and lovin' life — man, I was 25 years old, and I had the world by the tail! As August rolled around, though, I hadn't made enough money to qualify for the PGA Championship at Crooked Stick Golf Club in Carmel, Indiana, which is just outside of Indianapolis. I was close enough to know that if I'd made a few more putts along the way, I'd be getting ready for my first practice round. But I was far enough back at ninth alternate to figure I had no chance in hell of getting in. The week before, I'd played the Buick Open in Grand Blanc, Michigan, just outside of Flint, and I'd stunk up the place, missing the cut by a bunch. So I went back to Memphis, where I'd just closed on my first home and spent $32,000 I couldn't afford on a new BMW for Bettye, my fiancée. I did pretty much what I always did when I was home. Practiced at Chickasaw Country Club. Hung out with whatever buddies were around. Probably ate lunch at McDonald's. Maybe played some in the afternoon. Went home. Had a few drinks, no doubt. Nothing out of the ordinary. I never once thought I had a prayer of playing in the PGA Championship. A couple of foursomes of guys would have to withdraw for me to get in. There was no way that was going to happen, not in a major. But then a few guys dropped out for one reason or another, and every time one did, I'd get a call from Ken Anderson of the PGA of America to tell me that I'd moved up a notch. Nothing to get excited about. Then about five o'clock Wednesday afternoon, he called to say I was now third alternate. Still not likely I'd get in, he said, what with the tournament beginning in less than 24 hours. Now, most Tour pros wouldn't walk across the street to watch somebody else play golf, but I decided to drive on up to Indianapolis to watch the PGA, to hang out, and — okay, I'll admit it — to have a few drinks with my buddy Fuzzy Zoeller. Fuzzy had won the Masters in 1979 and the U.S. Open in 1984. He was a serious player. A major player. And he was just maybe the most popular guy on the PGA Tour. And I was — as I said — not exactly a household name. Or put it another way: I was a nobody. But Fuzzy and I had met in 1989 at the Federal ExpressSt. Jude Classic in Memphis, where I lived. Being a local boy, I'd gotten a sponsor's exemption. Fuzzy spotted me and asked me to play a practice round with him. We've been close friends ever since. But my best friend in those days was Jack Daniels. Had been since I was 19. Most of the time, I was drinking Jack like you wouldn't believe. A fifth a day, sometimes more. If I was in a bar, it would be Jack and Diet Coke. If I was home or in a hotel, I'd just drink it straight out of the bottle. Most people would be drunk for a month on what I'd had before dinner. I'd paid a couple of visits to emergency rooms in college to have my stomach pumped. But maybe the scariest time was in Falmouth, Maine, in 1990, the night before a Hogan Tour tournament began. I was partying with some guys, and I was having what had, over the summer, become my usual: triple Jack Daniels on the rocks, no water, three at a time. After a while the waitress said the bartender wouldn't serve me but one drink at a time. Fine. I'd order a drink, she'd bring it to me, and I'd drain the glass while she was standing there — and ask for another. After a little of that, I had to be taken to a hospital because I'd passed out with my eyes open and the guys I was drinking with thought I'd had a stroke or something. The next day I shot two under. But none of that stopped me. I was still young enough and dumb enough to believe I was bulletproof. Back then, JD and JD were quite a pair — practically inseparable.